Buy Moov Spray - Paras Pharma Moov Pain Relief Spray - Useful Remedy For Backache Pain Relief, Neck Pain, Shoulder Pain, Muscular Pain. Moov is 100% Natural Ayurvedic preparation. It's 'Fast Pain Relief Formula' relaxes the muscles and provides fast relief. The specialized Ayurvedic ‘Fast Pain Relief Formula’ with the power of Nilgiri Oil contains other active ingredients such as Tarpin Oil, Oil of Wintergreen and Mint flowers. 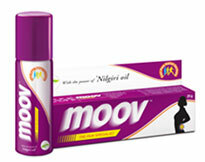 Moov penetrates deep inside, produces warmth and helps you recover fast. MOOV Spray. Ideal for consumers with hectic lifestyles, prone to recurring backaches, they can now avail of instant pain relief by means of a spray. Ideal for sports persons, this spray is convenient and easy to use. Relief from backcahe, bodyache, muscle pain, sprain or joint pains. Shake well before each use. Spray the contents from 5cm distance on the affected areas 3-4 times a day. Do not spray on open wounds.